Industrial scales are utilized for a variety of different applications at factories and manufacturing facilities around the world. Platform scales must be precise to ensure that weight readings are never incorrect. In industrial settings, chemicals and materials can be very expensive and an incorrect reading can cost a company significant money. Many companies claim to offer the best technology for your platform scale needs, but often these companies are simply looking for a quick buck and are not focused on the highest quality technology. 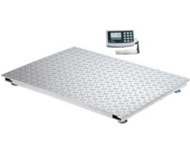 Arlyn Scales offers a wide variety of platform scales for industrial use. Our 3200 Series Platform Scales is one of our most popular models. All of our scales are manufactured with materials produced in our US based, cutting edge facility. Our company is headquartered in Long Island, New York and has been manufacturing scales for more than 30 years. We have seen the industry change significantly over the past 30 years, even pioneering some big changes ourselves, but our commitment to quality and the latest scale technology is unwavering. There are a variety of reasons that set our industrial scales apart from the competition. One of the most important but often overlooked types of technology in the scale industry is our Setpoint technology. Setpoint technology allows you to enter up to eight weigh values into one of our scales, which can be used for automatic refilling as well as other common PLC functions. If you are familiar with PLC controllers you understand that our scales can be a part of multiple inputs and outputs that can be used to control a variety of different machinery to further automate various industrial functions. Many of our customers use our Setpoint technology to monitor materials. You can easily program our equipment to monitor a scale until it reaches a certain weight at which point it can either turn off or turn on a designated piece of equipment. For instance if you are pumping a large amount of material into a drum, you can have our scales send an electrical signal to the pump when the scale reaches a certain weight value. This allows you to control your materials in a much more refined manner. Another feature of our Setpoint technology is that you can set multiple target weights to accomplish multiple functions. For instance if you wanted to ensure that you got a very precise amount of liquid using a pump, you could set one target weight to slow the pump down to a trickle and then set a secondary weight which would stop the pump immediately. This way you are very accurate when transferring your materials using pumps into drums. In a similar fashion, you can also use this technology to formulate products that use different ingredients. You can control various pumps until a certain amount of material is dispensed from each drum to formulate your product with very little human interaction. Setpoint technology offers industrial customers the ability to reduce labor costs while also improving material handling. In today’s fast paced economy, companies are always looking for ways to cut costs and with Arlyn Scales, you can significantly cut your material costs while actually improving your industrial products at the same time. If you have researched industrial scales for any length of time you understand that load cells are one of the most important components of a high quality platform scale. At Arlyn Scales, we understand the importance of load cells and therefore only construct ours from stainless steel. Other competitors manufacture load cells from either aluminum or steel. While these materials have their application in the scale industry, they are not effective at resisting corrosion or accepting the weight of larger loads as stainless steel load cells. Load cells must stand up to extreme abuse including overloading and shock loading. With inferior materials, load cells will not last as long, which means downtime for repairs or room in the budget for a new scale. We utilize four stainless steel load cells in our platform scales to offer the most rugged weighing technology possible. Because we manufacture our own load cells, we can group load cells by their identical output signals, which eliminates the need for summation boards, a main cause of operational failure. By eliminating these boards, Arlyn Scales is able to create scales that last longer and are much more accurate than those that utilize summation boards. Our Series 3200 Platform Scales offer two different options in terms of capacity and resolution. If you are looking for higher capacity, our 320M platform scales offer a capacity of 1,000 pounds and a resolution of 0.2 pounds in various platform sizes. If you are looking for better resolution, our 320D model offers a capacity of 500 pounds with a resolution of 0.1 pounds in various platform sizes. As you can see, the resolution of the 320M models is only half of the resolution of the 320D models, yet the capacity is twice as much. It is important to determine your capacity and resolution needs to determine which of our scales will work best for you. If you require both high capacity and high resolution, ask us about our Ultra Precision line of a scales that utilizes Surface Acoustic Wave (SAW) technology. We can also customize any of our platform scale models to conform to your exact needs. Also ask about our different connectivity options including Ethernet, USB, and data logging for data storage and transmission. For help finding the most cost effective and appropriate weighing solution for your industrial needs, contact us today! We can be reached by phone at (800) 645-4301 or through the form on our Contact Us page. We look forward to answering your questions and guiding you through the selection process.